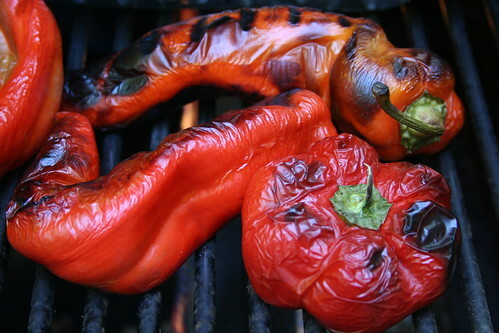 Grilled peppers make wonderful additions to all sorts of dishes. Guess what, it is easy to grill peppers. You can grill all sorts of peppers. Some of my personal favorites are red bell peppers, pablano peppers, jalapeño peppers, to name just a few. You can grill them on your stovetop preferably gas, in your oven by broiling them, or on a grill. If you use coals consider grilling up a few peppers after you finish grilling the steaks. After grilling your peppers you can make many different dishes with these flavorful peppers. Start by rinsing off the peppers. Next get your grill hot. If your using a gas grill medium is a good heat. Place your peppers on the grill, and let them char and let the skin turn black. While you want the skin to turn black, you don’t want the meat of the pepper to burn. Let the skin char on all sides. When you are done place the grilled peppers into a paper bag, close the bag, and let the peppers cool. It’s a good idea, to put the bag either in your sink or on the ground, they may leak out juices. Now if your using hot peppers you may want to use gloves. If you do not want to use gloves be sure not to put your fingers anywhere near your face. Strip the skins off of the peppers, cut open the peppers and take out the seeds. If any skin is hard to remove you may want to use your knife. Do not rinse your peppers, as you will wash away the taste. These store well in the refrigerator for up to three days. Wonder what to do with your peppers? You can add them to omelets, serve them up as a salad, serve them in a salad, and so much more. To make a simple salad with them you can simply add olive oil, and lemon juice to flavor up the peppers, and chill. Other dishes I like to make with grilled peppers are chile rellenos, grilled red pepper butter, and fresh green salad with grilled peppers. Let your butter soften until it reaches room temperature. Finely dice the garlic and red bell pepper and combine with the softened butter. You can shape the butter into interesting shapes now, or you can simply store in an air tight container, and enjoy on grilled meats, bread, and vegetables, and so much more.